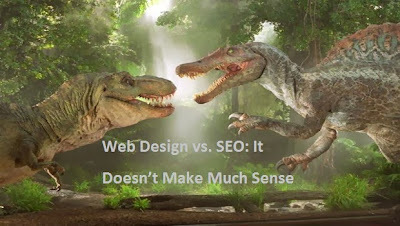 It’s a common sight: designers bashing SEOs and vice versa. We all have been seeing this happening for a long while now. And it’s probably not going to end any soon. It might get pregnant and more heated in a year or two, though. Unless, of course, both sides realize that they finally need to go along, that clients don’t give a crap about their altercation and are interested in one thing above everything else: a website that’s great usability,appearance and at the same time ranks well. What’s The Fight All About? We all know the issue: Web designers (or developers) claim that rankings are not everything, that SEOs often use aggressive techniques to manipulate rankings and can most probably guarantee snake oil more than anything. SEOs, on the other hand, claim that Web designers often make their life difficult with poor coding and have little to no knowledge of SEO; that neither design nor content is everything – other things matter too in making a website more user friendly and more search engine friendly. The Smashing Magazine post by Paul Boag from last December that drew the ire of the SEO community can be taken as a good example here. As we all know, Paul was fatally attacked as an individual, as a designer and as a Smashing Magazine author for discussing his thoughts on what’s the best way to go about SEO. Of course Paul made some wonderful points – such as “great content is better produced in-house, rather than being outsourced to an agency” and “website owners are unhealthily obsessed with their rankings on Google” – but he also undermined the importance of all SEOs, showed his lack of knowledge about what SEO exactly is and somewhere suggested that a good designer can take care of SEO as well. Then there was a rebuttal by Will Critchlow and Bill Slawski and, by and large, the whole SEO community. The post discussed the things Paul missed out on, why SEO is important and some SEO tips. Embrace the mobile-first responsive Web design approach (recommended by both Google and W3C) if user interactions on your website through mobile devices are similar to those on desktops. It it’s not so, embrace the dedicated mobile site strategy. Google recommends you to choose what’s best for your business. Don’t fall for the ongoing bloated site trend – on a mobile device a Web page on an average takes 10 secs to load. Instead make sure your site loads in less than 5 secs. Search suggestions in within-site search are good and even a must have, but convert search into navigation wherever possible. Design readable sites; make sure that font doesn’t break when a user uses text-only zoom in functionality. Stick to the latest Web standards. Think about visually impaired people too. Keywords are not dead and never will be—but using them intelligently has become more important than ever. Given the changing and often shortening search terms because of on-the-go usage of the Web, mobile-specific keyword research has become imperative too. Think about infographics, newsjacking, guest blogging and video content to get natural (and high-quality) backlinks and do away with practices such as article syndication, comment spamming and the like. Focus on building not just links but high-quality and, most importantly, relevant links. “Relevance is the new PR,” eloquently said an ex-member of Google’s search quality team. Stay away from known hazards such as accidentally blocking a complete site with robots.txt. Embrace Facebook’s Open Graph protocol and Twitter Cards to give an optimal experience around your content in the social space. Use Google Plus authorship benefit, which, many say, is the future.